MAKER: Engrav'd by Henry Meyer, from a Miniature by George Saunders. Sarah Sophia Child. Countess of Jersey. Engrav'd by Henry Meyer, from a Miniature by George Saunders. Stipple printed in red ink, with large margins; 280 x 225mm. 11 x 9". A good impression. 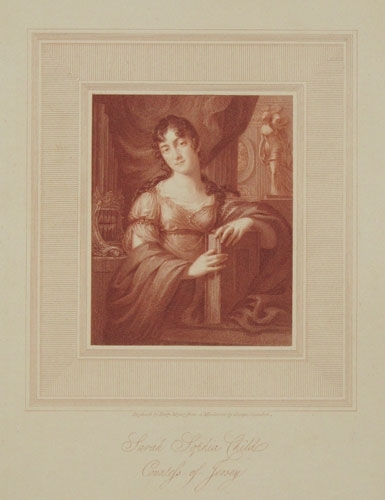 Portrait of Sarah Sophia Child-Villiers (née Lady Sarah Sophia Fane), Countess of Jersey (1785-1867), political hostess. In an interior, hand resting on a large book, an organ in the background. After George Sanders (Saunders) (1774-1846), portrait painter and miniaturist. From Broadlands the Palmerston family. Fill in the form below and the exhibitor of this item will be notified of your interest.